Plans for the development of the $150 million Multidisciplinary Research Building 1 were approved by the UC Board of Regents in late 2015. This new 90,000 sq ft building will support multidisciplinary research and provide additional lab space for faculty researchers. 2015 Life Science R & D Expenditures: 111th Ranked = $7,562,4000. UC Riverside received $20,350,129 in life science research funding from the NIH in 2016. A new $366 million motor vehicle and engine emissions testing and research facility will be built at UC Riverside. Construction will break ground in 2017 and be completed in 2020. UCR researchers won $1.69 million as a part of the UC President’s Research Catalyst Award. The grant will fund research on the microbiological, biophysical, and geochemical mechanisms controlling soil aggregate formation. 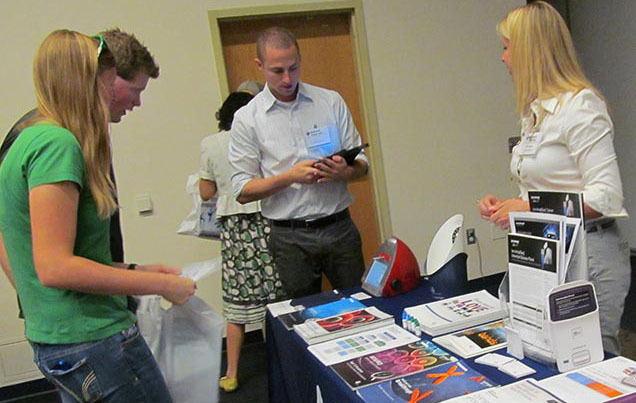 Last year, the BioResearch Product Faire™ event at UC Riverside attracted 211 attendees. Of these attendees, 33 were purchasing agents, professors and post docs, and 10 were lab managers. These attendees came from 21 different research buildings and 25 on-campus departments. Connect with Southern California researchers by showcasing your laboratory products at this Riverside event. "This Biotech fair was fantastic. The vendors not only have a deep knowledge of their products, but they are sincerely interested about the people who approach their booth. I will look forward to attending this fair again! I made great contacts with some vendors and they will be the first people I call the next time I need supplies!